Today we are privileged to share post guest-authored by a new speech-language pathologist and parent of a child who uses AAC, Brianne Bolin. She shares her firsthand AAC perspective on how lessons learned in graduate school have had a positive impact on her own family life. 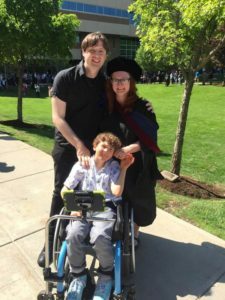 Bolin, dressed in graduation robes and hood, and her fiancé, Bryan Peterson, smile and pose outside with her son, Finnegan Bolin, a curly-haired pre-teen seated in a wheelchair with an adaptive pole holding his communication device. After the graduation ceremony, I followed the bagpiper out of the auditorium and into the hall with my fellow new speech-language pathologists (SLPs). My family was the first to follow us out, as the accessible seating was by the exit. My eleven-year-old son visually scanned the crowd. I approached to give him a hug. He smiled before reaching to push my face away, his signature reaction to most hug attempts. I laughed, respecting his refusal, then modeled the phrase, “We did it!” on his speech-generating device (SGD). When my son was born with an anoxic brain injury that resulted in cerebral palsy, I was an adjunct English professor. I had never heard of SLPs, and I thought that aspiration meant a goal to attain, not an event to avoid. My world imploded. All my training in language and literature felt useless, as it couldn’t help me troubleshoot our new challenges: Why is he arching in pain during feeds? Why can’t he finish his bottle in a half hour? Why isn’t he sitting up yet? As the years passed, I received helpful information through intense communication with his specialists and eager participation in his therapies. I performed home carry-over therapy as instructed, then researched in isolation. But even though I was taking undergraduate courses in communication sciences by the time he was in 3rd grade, neither I nor his team had effectively taught him to communicate using language. Despite my attempts to convince the school team to incorporate his SGD into activities, it remained untouched in his backpack when I observed his classroom. That fall, he “graduated” from private speech therapy after successfully learning one carrier phrase (“I want”) in conjunction with two category groups (“toys” and “vehicles”). 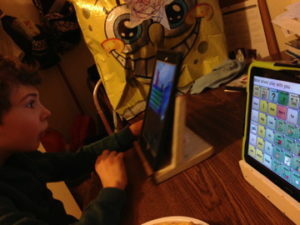 At home, I expected him to be a fluent AAC communicator without offering him any models, as if he could decode and speak the second language without witnessing anyone else using it. I also frequently demanded that he “Tell me with your talker” after he had clearly communicated his needs in another mode, such as reaching for an object. As a result, he became so frustrated that he developed the habit of throwing his SGD. Who can blame him? We had hit a communication wall. When he was in 4th grade, I reinstated private therapy at the Speech-Language Institute in Midwestern University’s Multispecialty Clinic after learning about Kathleen Post, a faculty member who had 30+ years of experience in augmentative and alternative communication (AAC). We began to see improvement, especially in terms of buy-in from my son that his device provided power and enjoyment. When it was time to apply to graduate school, my son was in the 5th grade, and I chose to attend Midwestern. By a wonderful coincidence, my time there synched with Mrs. Post’s research project with Dr. Jill E. Senner and Matthew Baud. Their work investigated the effects of training parents in partner-augmented input (PAI), an AAC intervention strategy that enables caregivers and peers to model communication effectively with AAC users on their own systems, on parent and child SGD use. I became involved and was trained as a parental coach. As I learned Senner & Baud’s PAI techniques, I put them into practice in my own home. SGD from room to room independently. On a particularly difficult evening, he swiped every object except his SGD off the table in a fit of rage. I was floored. He also began initiating communication regularly. He expressed anticipation for family visits (“Grandma Grandpa come two weeks”) and gave us insight into his own interests and preoccupations regarding the Polar Express (“Polar Express go please December”) and Wheel of Fortune (“Mom wheel play with you”). We learned that he noted the numbers of his school buses on the morning he typed the expected number, “012,” when “007” arrived instead. Communication became a joy, and he was as eager to connect and share with us as we were to hear his thoughts. S: Slow rate. I slowed my rate of speech to accommodate for my use of his SGD, which allowed my son to visually map the location of each word. Mo: Model. I simultaneously spoke and pressed the corresponding words on his SGD so he could learn his own second language. R: Respect & reflect. I stopped making him “Tell me on your talker” and started acknowledging his nonverbal communications with a model to (a) let him know that his messages were heard (respect) and (b) show him an alternate way to communicate them (reflect). I believe that this step improved his throwing and swiping behaviors. R: Repeat. I repeated key words over and over. If he was motivated to use them, he would learn not only where they were but how to use them. I believe this step was key to his understanding of prepositions. E: Expand. Just like an SLP would do for a verbal child, I repeated his utterances while adding 1-2 more words to help him learn how to combine words and use syntax. S: Stop—the most important step. I stopped talking and allowed him processing and response time. This step is crucial for reducing prompt dependency and increasing independence. As an SLP, I am trained to examine the validity of scientific evidence and to weigh the results accordingly. I’m aware that anecdotes and personal experiences carry no weight in the scientific community. However, as a parent, I’m certain that PAI helped my son learn the value and power of AAC. Thankfully, the evidence base thus far supports the intervention: PAI has resulted in increases in receptive and/or expressive vocabulary (Dada and Alant, 2009; Drager, Postal, Carrolus, Castellano, Gagliano, & Glynn, 2006; Harris & Reichle, 2004; Kent-Walsh, Binger, & Hasham, 2010), frequency of school staff SGD use (Senner & Baud, 2017), and multi-symbol conversational turns (Binger, Kent-Walsh, Ewing, & Taylor, 2010; Binger & Light, 2007; Binger, Kent-Walsh, Berens, Del Campo, & Rivera; 2008), to name a small sampling of the many benefits. “Book. I want to read,” he affirmed. Binger, C., Kent-Walsh, J., Ewing, C., & Taylor, S. (2010). Teaching educational assistants to facilitate the multisymbol message productions of young students who require augmentative and alternative communication. American Journal of Speech-Language Pathology 19, 108-120. Dada, S., & Alant, E. (2009). The effect of aided language stimulation on vocabulary acquisition in children with little or no functional speech. American Journal of Speech-Language Pathology, 18, 50-64. Drager, K. D. R., Postal, V. J., Carrolus, L., Castellano, M., Gagliano, C., & Glynn, J. (2006). The effect of aided language modeling on symbol comprehension and production in 2 preschoolers with autism. American Journal of Speech-Language Pathology, 15, 112-125. Harris, M. D., & Reichle, J. (2004). The impact of aided language stimulation on symbol comprehension and production in children with moderate cognitive disabilities. American Journal of Speech-Language Pathology, 13, 155-157. Kent-Walsh, J., Binger, C., & Hasham, Z. (2010). Effects of parent instruction on the symbolic communication of children using augmentative and alternative communication during storybook reading. American Journal of Speech-Language Pathology, 19, 97-107. doi:10.1044/1058-0360(2010/09-0014). Brianne Bolin is a speech-language pathologist completing her clinical fellowship year at the School Association for Special Education in DuPage County’s Multi-Needs program and a graduate of Midwestern University. Previously, she was an adjunct professor at Columbia College Chicago and brought awareness to the economic and emotional plight faced by part-time university faculty when she was featured in Alissa Quart’s Squeezed: Why Our Families Can’t Afford America. She co-founded PrecariCorps, a 501 (c)(3) dedicated to helping adjuncts pay the bills, with Dr. Joe Fruscione and Kat Jacobsen. She was also featured as a contributing author in Dr. Robert Craig Baum’s Thoughtrave: An Interdimensional Conversation with Lady Gaga. Disclosure Statement: Ms. Bolin has no financial relationships to disclose. As for non-financial relationships, Ms. Bolin was trained by and worked with Dr. Jill E. Senner, SpeakUp blog editor, for research requirements leading to an M.S. in Speech-Language Pathology. This is lovely, and timely. I’d love to print this out to share with my team of SLPs, and a few parents, but printing from the website leaves squished text on the page. Any chance I can get a printable form of this article? I am an Early Childhood Special Education Teacher. For the past three years, I have had the opportunity to use voice output AAC devices with several of my students. While I am still learning and by no means an expert, I am fully convinced of the power that AAC gives our students to communicate. I have seen first-hand the joy on a child’s face when she realized that she could use her “talker” to make her wants and needs known, but also to make comments and have conversations with others. The decrease in frustration is measurable, and even having one communicate to me that she was “mad” while glaring and putting the device in her backpack rather than screaming and throwing things was exciting. To see my students take ownership of their devices is thrilling. I have also seen the impact it can have on families, when all members learn to use the device, giving their child an opportunity to fully participate in a range of activities. It truly does open up a new world for them. I would also love to print this article. Love this article! It’s so great when we can set up opportunities that truly spark communication in an authentic way and afford children the ability to connect with others and share their inner world. Keep up the great work!